Takuo Miyagishima, one of the most notable design engineers in the motion picture industry, has been voted the Gordon E. Sawyer Award by the Board of Governors of the Academy of Motion Picture Arts and Sciences. To Greg Cannom and Wesley Wofford for the development of their special modified silicone material for makeup applications used in motion pictures. This proprietary modified silicone makeup system allows for the creation of either partial or full-face appliances for motion picture makeup effects that move like real flesh, have translucency similar to skin and will accept standard makeup materials. To Jerry Cotts for the original concept and design and Anthony Seaman for the engineering of the Satellight-X HMI Softlight. With its large radiating surface and thin profile, this collapsible, self-contained HMI softlight provides a diffuse light to simulate daylight in location interiors, where space is often limited. To Steven E. Boze for the design and implementation of the DNF 001 multi-band digital audio noise suppressor. Designed in the early 1990s when digital signal processing was in its early stages, the real-time digital approach of the DNF 001 provided accurate filter response with minimal interaction, allowing noise attenuation with fewer artifacts. To Dr. Christopher Hicks and Dave Betts for the design and implementation of the Cedar DNS 1000 multi-band digital noise suppressor. The Cedar DNS 1000 is specifically designed to reduce background noise from the recorded motion picture dialog. With its precise filters it allows the frequency ranges to be altered or even cascaded to pinpoint and reduce the offending noise. To Nelson Tyler for the development of the Tyler Gyroplatform boat mount stabilizing device for motion picture photography. As a pioneer in this area of motion picture technology, Tyler's 2-axis, hydraulically-powered camera mount successfully eliminates the pitch and roll associated with camera shots taken from a boat in the water. To Dr. Julian Morris, Michael Birch, Dr. Paul Smyth and Paul Tate for the development of the Vicon motion capture technology. Vicon Motion Systems developed special-purpose cameras for motion capture with software systems that maximized their impact on the motion picture industry. To Dr. John O. B. Greaves, Ned Phipps, Antonie J. van den Bogert, David J. Warrenderand William Hayes for the development of the Motion Analysis motion capture technology. Motion Analysis Corporation developed special-purpose cameras for motion capture with software systems that maximized their impact on the motion picture industry. To Dr. Nels Madsen, Vaughn Cato, Matthew Madden and Bill Lorton for the development of the Giant Studios motion capture technology. The software solution created by Giant Studios applied a unique biometric approach that has influenced the development of motion capture technology for motion pictures. To Alan Kapler for the design and development of Storm , a software toolkit for artistic control of volumetric effects. "Storm" employs an efficient method for directly manipulating volumetric data to create effects such as clouds, water and avalanches with familiar operators inspired by image compositing and painting operations. To Gyula Mester (electronic systems design) and Keith Edwards (mechanical engineering) for their significant contributions to and continuing development of the Technocrane telescoping camera crane. With its electronically driven leveling head, adjustable moveable weight carriage, and lightweight, extremely precise telescoping beam elements that allow camera movement during shots, the Technocrane has redefined the state-of-the-art in camera crane technology. To Lindsay Arnold, Guy Griffiths, David Hodson, Charlie Lawrence and David Mann for their development of the Cineon Digital Film Workstation. Cineon pioneered a commercial node-graph compositing system establishing a new visual method for direct manipulation of the compositing process, which influenced and defined modern digital compositing workflows. 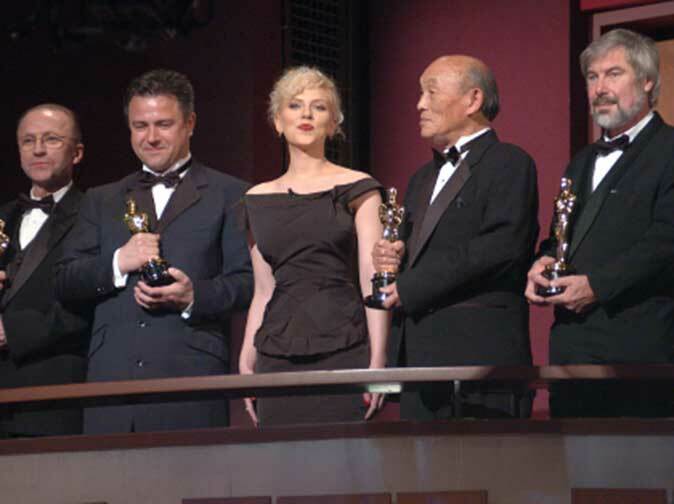 The Academy of Motion Picture Arts and Sciences presented an Award of Commendation to Arthur Widmer at the Scientific and Technical Awards dinner on February 12, 2005. Widmer was honored for his lifelong achievements in the science and technology of motion pictures, in particular his significant contributions to the development of the Ultra Violet and "bluescreen" compositing processes.